A recent article published by the Washington Post reports that Philadelphia’s Temple University is honoring a 45-year relationship sparked in a campus elevator. According to the article, Sharyn Rubin and Eric Schlesinger met on move-in day on September 6, 1972, while she was moving in and he was operating a dorm building elevator. The Philadelphia Inquirer reports Rubin formally introduced herself a few days later at a college mixer, walking up to Schlesinger and saying, “Hi, Mr. 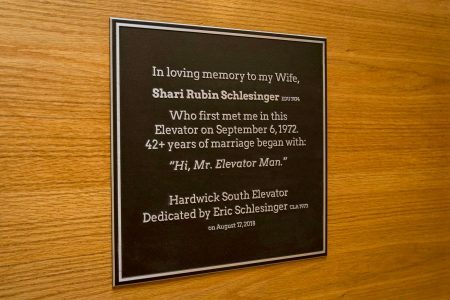 Elevator Man.” The quote is now affixed to the elevator, which was named for Shari Rubin Schlesinger last Friday. Shari died last year from colon cancer. She and her Elevator Man had been married for more than 42 years. Eric Schlesinger told the Washington Post that meeting his future wife in the elevator was “the most important thing” that happened to him at Temple. Photo provided by Temple University.